MEXICO – The public relations team at the Center for Instruction, Technology and Innovation recently received two awards from the National School Public Relations Association. 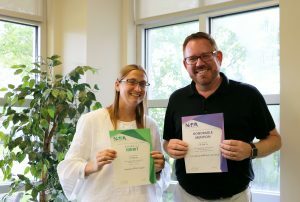 CiTi Public Information Specialist Sarah McCrobie and Graphic Design Specialist Todd Shear stand with awards earned by the National School Public Relations Association. For distinguished achievement in the category of Special Purpose Publication, honorable mention was given for the graphic design of the CiTi Audiology Mobile Unit vehicle wrap. For distinguished achievement in the category of calendar, an award of merit was given to the design of the 2017-18 Hannibal Central School District calendar. There were 1,061 entries in this year’s NSPRA awards program, with 648 receiving recognition. The CiTi BOCES public relations team currently services 14 school district clients, nine in Oswego County in addition to CiTi BOCES, two In Wayne County and four in Tompkins-Seneca-Tioga counties.